Stop back to see new listings that will be added as quickly as we can and as new information becomes available. Additions and corrections are welcome. http://www.gebrueder-fruehauf.de/Hendrik learned his trade in Suhl while Germany was located behind the iron curtain. 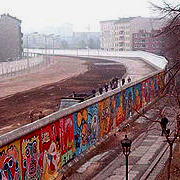 When the wall came down and Germany was re-united, he finally had access to the work of other engravers in England, Italy and the USA and has met some of them. This widened his horizon and it did not take long before his talents were discovered. 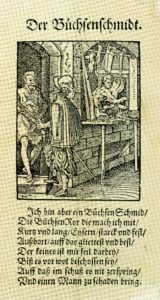 He is now ranked among the best of German and Austrian engravers. See some of his work in our Archive (Nr. 57-PG). Launch of “Funk-Gerl-Zwomantel Geschoss” – a super-bullet of the 1930’s. Very broad production range in hunting guns. Superb craftmanshipAn article about Funk can be found in our Archive.A 182 page book In German and in English with the Funk history, a Funk catalog and many photos was brought out by Peter Ravn Lund in Denmark.For more information and for ordering a book visit www.bryndumlund.dk. Friedrich Wilhelm Greifelt and the businessman Albert Emil Schlegelmilch. 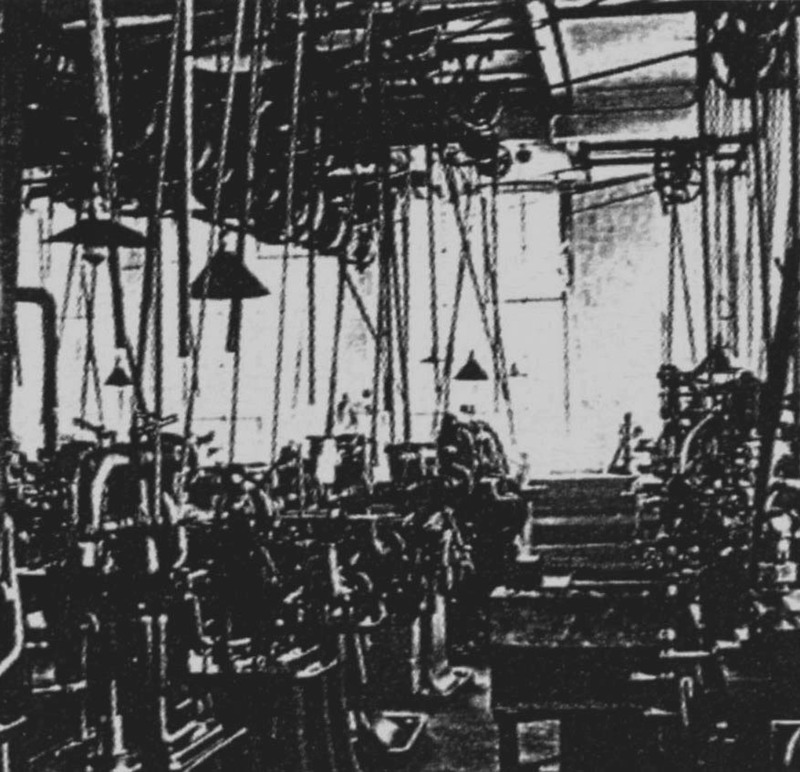 In 1891 the gun making shops were enlarged, and in 1902 Alfred Greifelt and Oskar Jung were in charge of the company. An office building was added in 1903. 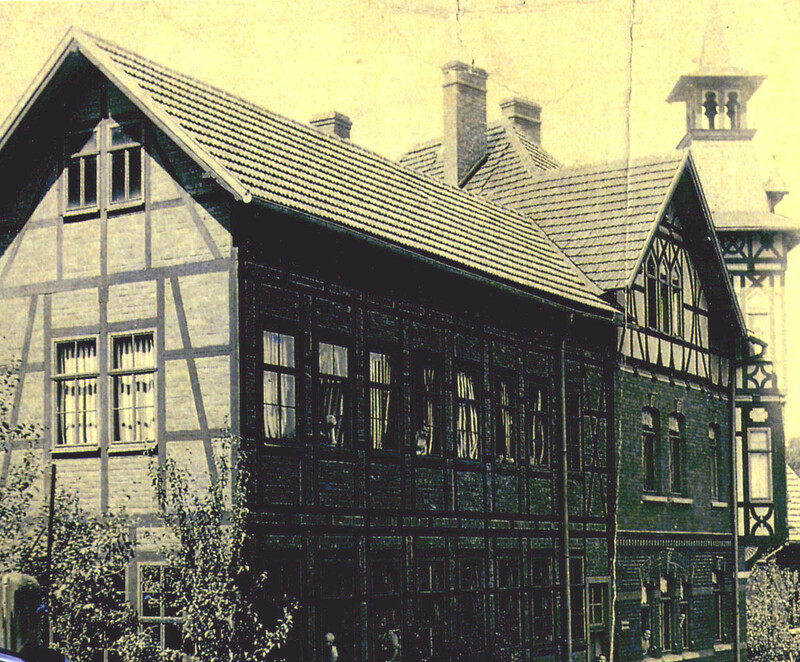 With the addition of a machine shop in 1917 the company was now among the largest mid-sized companies in Suhl. All this shows that the Greifelt Company evolved over the years into a major gun company that celebrated their 50 year anniversary in 1935, but in 1948, only 13 years later, the company was taken over by the Communist DDR Government in the divided Germany. The word GREIF combined with the image of a bird became the trademark of the company in 1922. Before and during World War II the Greifelt Company produced various components for the war efforts but apparently did not produce any complete military guns. 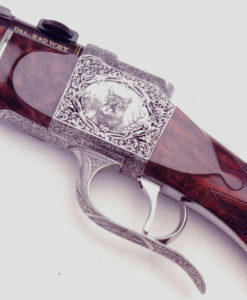 Records show that the company made a surprisingly great number of hunting guns for the civilian market during the war. Like other major companies in Suhl, Greifelt employed a considerable number of foreign workers from the eastern occupied countries, including women. When Russian troops replaced the American troops in 1945 all manufacturing had come to an end and the future looked bleak. Only 38 employees of the Greifelt Company made kitchen utensils and other useful items and others cut firewood in the forests, but by the end of the year the company employed 94 men and in April of 1946 guns were made again in addition to measuring tools. From June 1946 to May 1947 the company was managed by Alfred Greifelt under control of the Russian occupation forces. 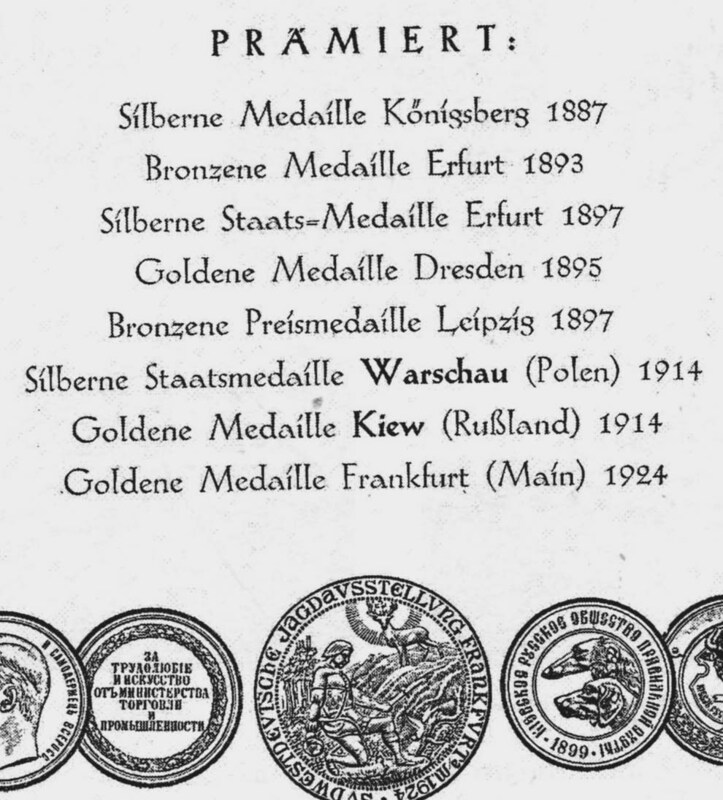 Many changes in management followed until the company became a Volkseigner Betrieb, a company “owned by the people” under a Communist Government. Between 1947 and 1948 the company was ordered to produce over 1000 hunting guns, increased in 1949. to 1500, as war reparation to Russia. 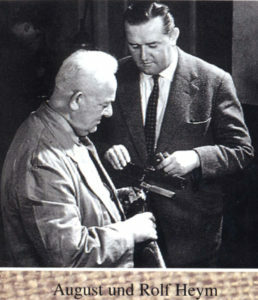 Greifelt hunting guns were exhibited at the 1949 Leipzig Trade Fair for the first time, opening the way for export to other countries. All this was achieved despite shortages of material and supplies, electricity outages and men ordered to mine Uranium in a nearby mine for use in the Soviet effort to build an atom bomb. 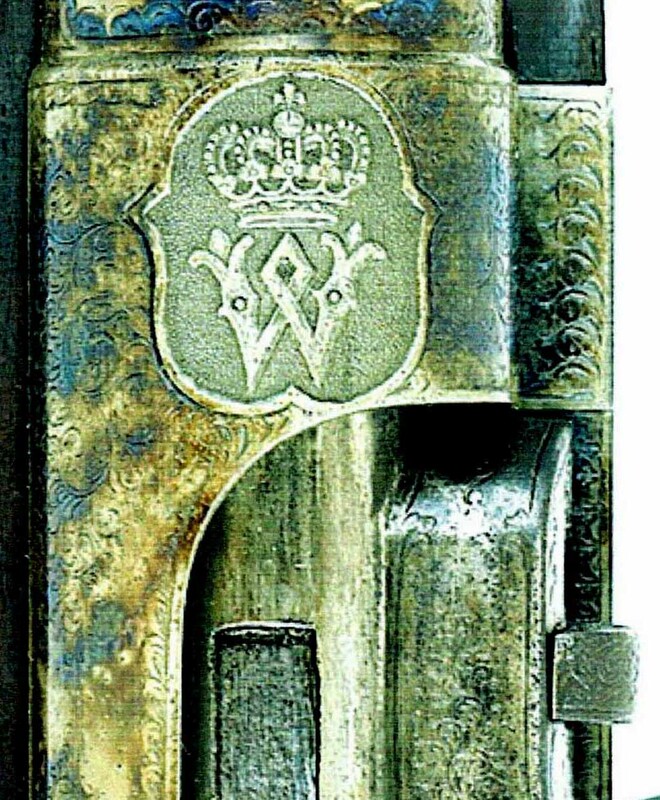 All large and medium size companies were now under the control of the government, and even the small gun shops were united in the government controlled Bühag. Under trying circumstances many good hunting guns were made during this time, Greifelt guns among them and still marked with the Greifelt name. But many of the best craftsmen and business managers left East Germany when the border with West Germany was still porous border, and after the Berlin Wall went up in 1961 by way of the divided and blockaded Berlin and the Luftbrücke, the Airlift by American and British airplanes. During those years 3.5 million East German residents escaped to the West, among them Fritz Greifelt. 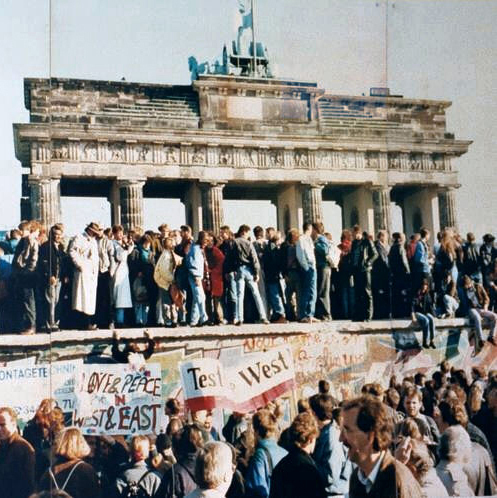 In 1989 the Wall came down, driven by a popular uprising, and the Communist Government collapsed. Germany was officially re-united in 1990. The free world and most East Germany citizens rejoiced, but hard times followed because the economy of East Germany collapsed. The export to the eastern countries came to an end and the companies could not compete with those in the west and the free world. All the disowned gun companies in Suhl, as well as most other companies all over East Germany, were now controlled by the Treuhand, a Government Agency that was given the duty to find buyers for all these companies that would prevent their total collapse. This effort stretched over many years with very mixed results. The only bigger company that survived in Suhlwas the Merkel Company, and this company also changed hands several times. 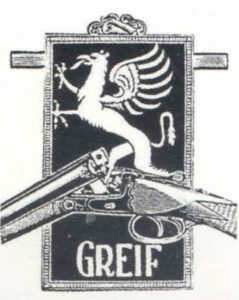 Greifelt guns made in Suhl are appreciated by the owners of the guns that survived the confiscation of all guns by American, British and Russian troops as soon as they entered a community. Many were destroyed right away, but others were brought home by soldiers who were allowed to keep two guns for their personal use. 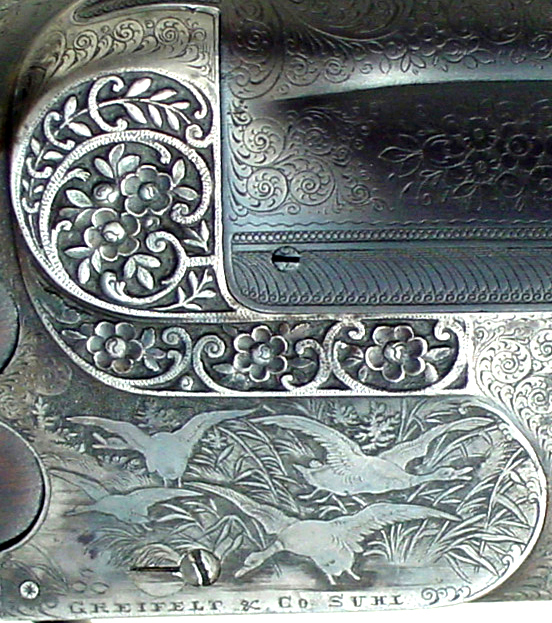 Many German hunting guns came to America this way and are now increasingly valuable, but many German guns were also exported to America before the two World Wars, and one can never be sure whether a gun was brought home from the war or was imported, among them the guns made by Greifelt. The catalog pages in our Archive (Nr.74-T) will show you that Greifelt made many different types and models, including over and under and side by side shotguns, double rifles, Drillings, combination guns, stalking rifles and guns with the Heeren Action and the Clamshell Actions. The factory buildings shown on the cover of the Greifelt catalog look bigger than the actual buildings, but Greifelt had impressive facilities, well trained gun makers and a very good reputation. The photo on the right shows the side of a Greifelt action on a gun that just came to our attention. It is a 410 Ga, over and under shotgun that is without a doubt a very rare gun. 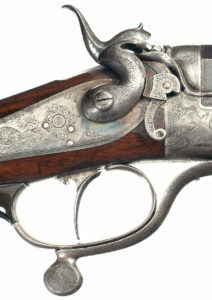 The flat surfaces on both sides of the standing breech all had elaborate deep relief engraving, and they can be considered the branding of Greifelt over and under guns. Carl Gründig served an apprenticeship as a gun maker, became a Master Gun Maker in 1876 and opened his own shop shortly thereafter. He was appointed as Königlich Sächsischer Hofbüchsenmacher to the Royal Saxonian Court by his Majesties Albert (1873-1903), Georg (1902-1904) and Friedrich Augusr III (1904-1918). 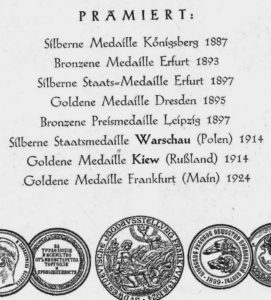 Thereafter his letterhead only listed the title Hofbüchsenmacher. Carl Gründig passed away in 1913. Although the titles were purchased with a yearly fee and also depended on the right political connections, it gave him prestige and attracted a prominent clientele. Dresden was the capital and Crown City of Saxonia and had attracted many Gun Makers since the founding of a Gun Makers Guild in 1545, among them gun makers from Suhl. 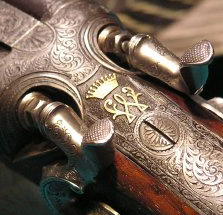 Some of the finest guns made in Suhl were made for the Court in Dresden. In the early years Gründig bought machined gun components made in Belgium and also in Suhlbecause he did not have the machines to do it himself. He must have also ordered completely finished guns and had his name engraved on them. At the end of the photo gallery we show a gun that has Suhl proof marks used since 1912. It also is stamped with a K that was the mark of a Kelber barrel maker in Suhl. 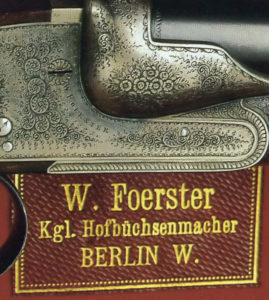 In 1916 the company became the representative for Saxonia of the Gunmakers Teschner and Collath. 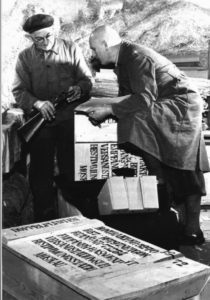 After Word War I (1914-18) the two sons continued the business mostly as a retail store and a shop to service the guns they ordered and sold. 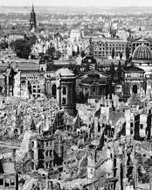 The business existed until early in February 1945 when Dresden was bombed by British and American planes that resulted in a firestorm that killed over 22,000 people and left the whole city in ruins. 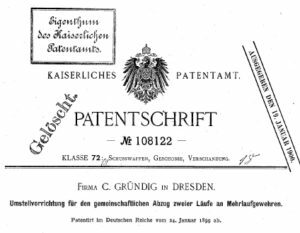 Two articles with photos of fine Gründig guns, additional information and patents of his inventions are in our Archive (Nr.59-PG). Tel. 250-489-4861Hagnrifles@live.comMartin Hagn is a German Master Gunsmith who had his own business in Germany but now has his shop in Canada. He builds best quality rifles to order.An article about Martin Hagn and his shop can be found in our Archive.The single shot action shown above was designed by Martin Hagn in cooperation with Hartmann & Weiss who are producing the action, use it for their own rifles but also for Martin Hagn who now has his own gun shop in Cranbrook, British Columbia.An article about Hartmann & Weiss can also be found in our Archive. www.hartmannandweiss.comThe guns made by these two German Master Gunmakers are made to order and ranked with the Best London Guns. 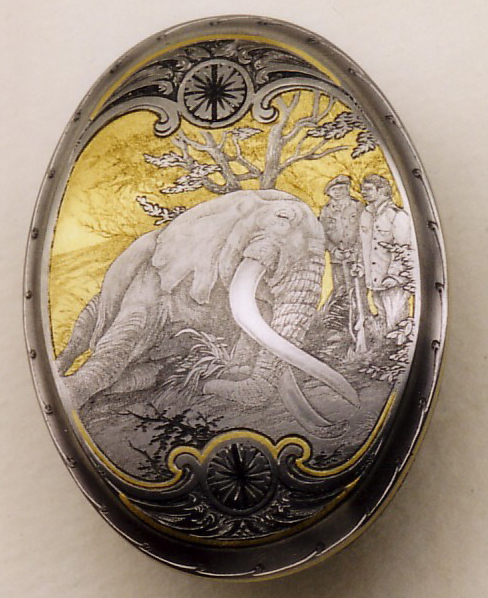 You can see their work at the Safari Club International annual show and at the IWA show in Nuernberg, Germany. 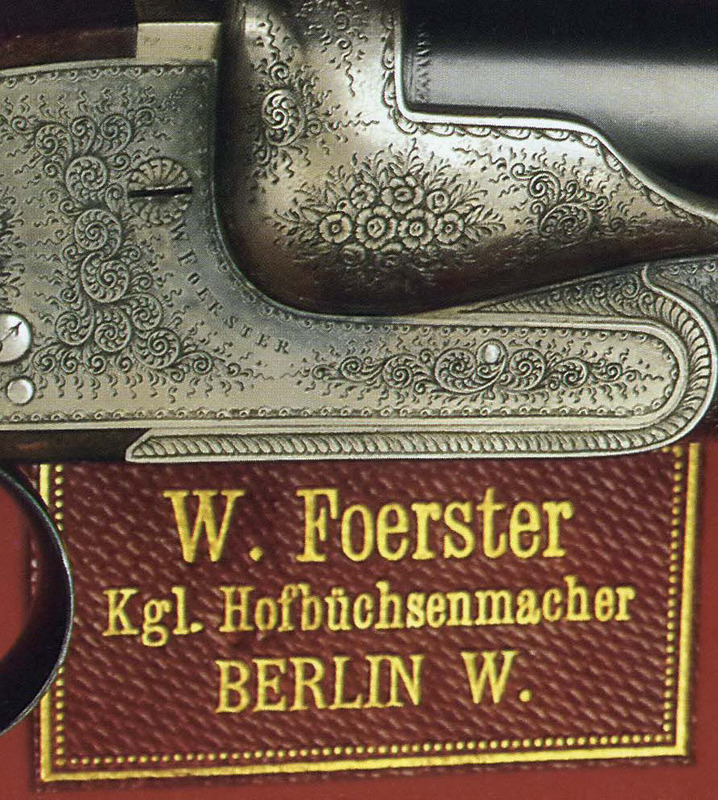 An article about them appeared in a Journal of the German Gun Collectors Association, and you find it in our Archive. 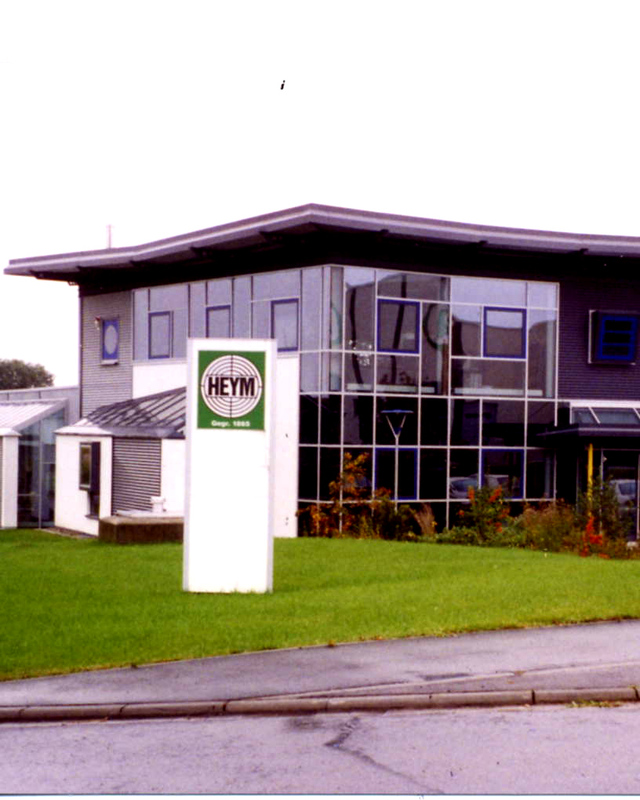 The lists of gun makers in Suhl with the last name Heym is quite long. In 1835 the list shows 16 Heyms that worked on guns, and in 1895 it grew to 25 men, most of them gunsmiths, two stock makers and one “Einsetzer” who hardened the actions. 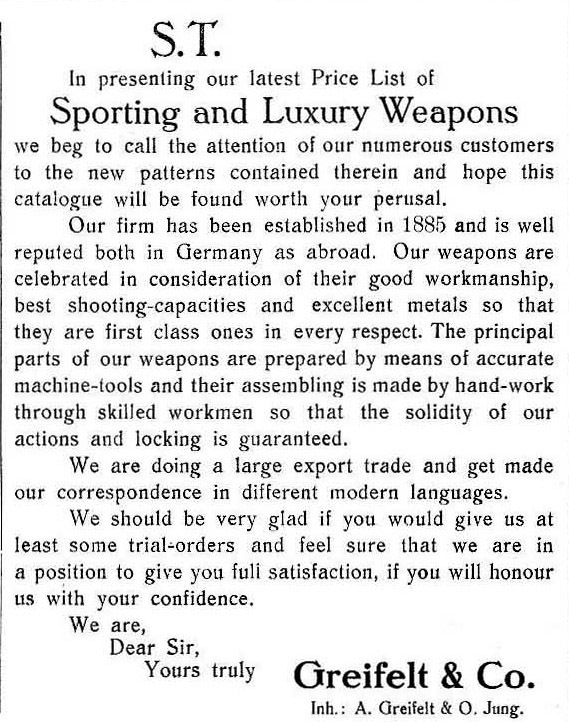 You can see the 1895 list of Heym gun makers and all those who worked on guns and also what little information we have at this time about a few of them in our Archive (Nr.68-T). The Friedrich Wilhelm Heym Company began in the building shown on the right in 1865 until itclosed their doors at the end of World War II in April 1945 when American troops occupied Suhl and Russian Troops took over three months later. The founder had set the goal for himself and his company to be among the best gun makers in Suhl. 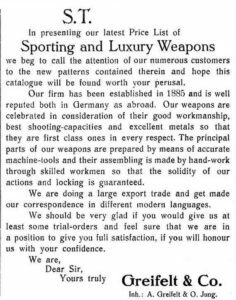 The founding of this company took place at a very opportune time that was praised as the “Golden Years of Gun Making”. 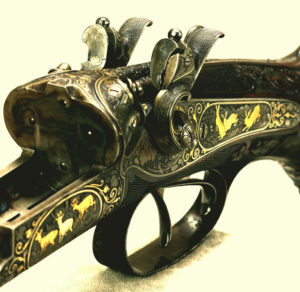 Breech loading guns had completely taken over from the muzzleloaders, percussion caps and back-action locks with outside hammers had also taken over, bringing about the first really practical hunting guns that were used not only by the privileged ruling class but by many ordinary people. Fulminates in percussion caps, in needle fire cartridges and finally in primers that ignited the powder inside brass cartridge cases had been invented, and center fire side by side double guns were now readily available. 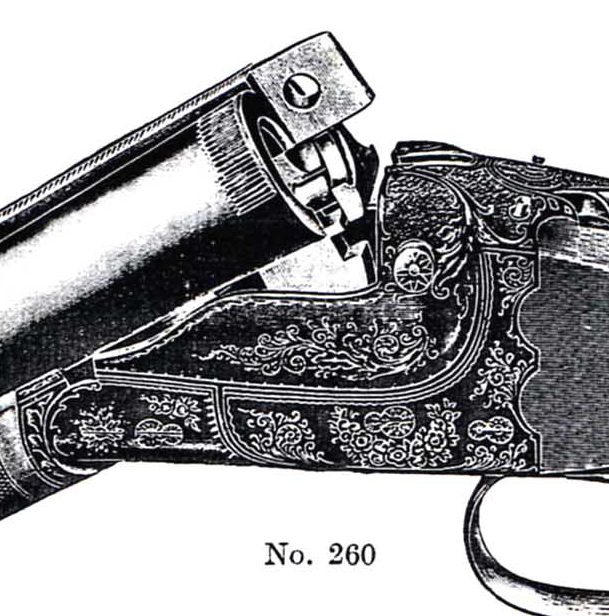 Three barrel hammer guns followed and various selector mechanisms that allowed the use of the hammer on the right to fire both the right upper barrel as well as the third barrel below were invented in short order. But the “hammerless” actions, where the hammers were located inside the action or covered by the stock, had still to be invented. 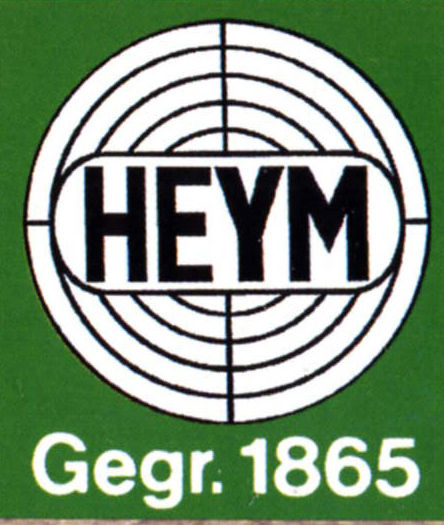 Heym was one of the very first companies to make a hammerless Drilling that had three triggers. The front trigger was hinged and could easily be pushed forward to reach the second trigger. Patent Nr. 60215 for a Drilling with three triggers was issued to Heym on May 24, 1891. You can find an article about this patent and other interesting information in our Archive (Nr.35-PG). 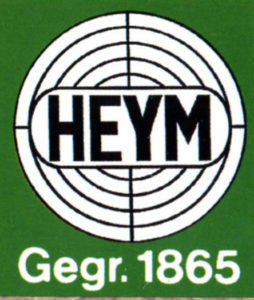 The Heym catalog pages from the early 1920s show the great variety of models the Heym Company made and still shows hammer Drillings and also the first patented hammerless Drilling with three triggers. You will find it in our Archive (Nr.64-T). 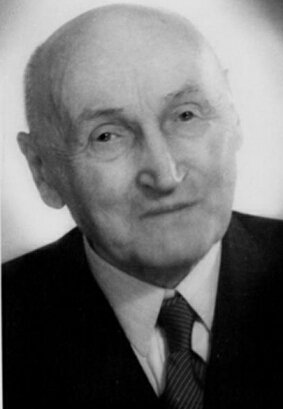 Adolf Heym assumed the management of the Heym Company in 1912 and opened up good sales connections in Russia. August Heym took over the management of the Heym Company in 1920 and began using Anson & Deeley type box lock actions on many of their models. Heym was also making some of the “Prussian Daly Guns” that the gun maker Lindner in Suhl had made up to the beginning of the first World War. As all major manufacturers in Suhl, Heym must have also made components for the war production but to the best of our knowledge did not make any complete military guns. You will find the story about the arrival of American troops in Suhl in our Archive (Nr.70-T). A few of the bigger gun makers in Suhl left with the American troops when they pulled out and Russian troops occupied Suhl. The explanation why the Heyms left Suhl after Russian troops took over from the American troops was found in an old article whose author is not known to us, and you can read it in our Archive (Nr.69-T). August and Rolf Heym started a new Heym factory in Ostheim located in the American zone of the divided Germany. Since the ownership and making of guns was not yet allowed, they made various other products like cuckoo clocks, spinning wheels and slide rules. They then had the opportunity to make a new Mauser-Heym bolt action police carbine, one of the first guns to be permitted by the American and British allies. 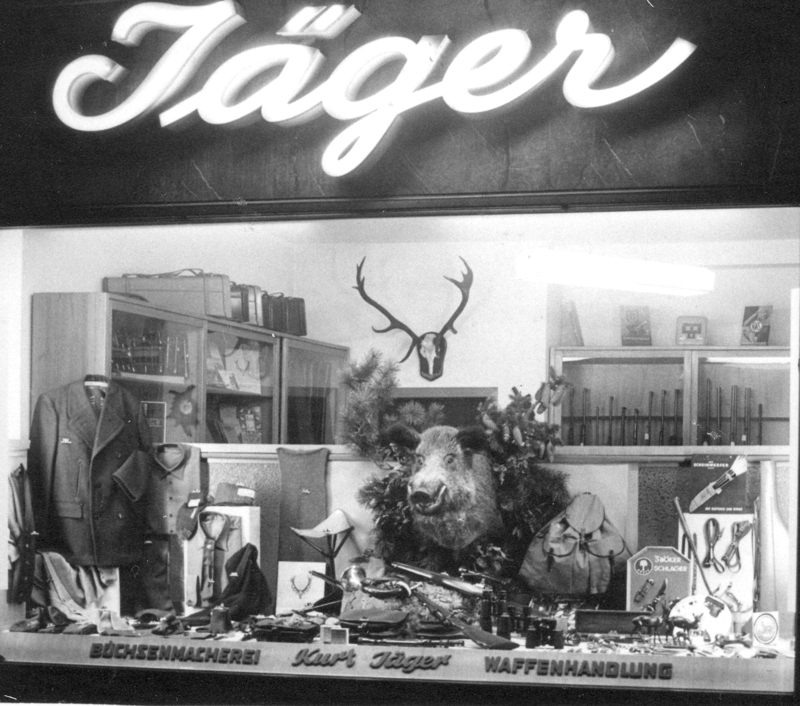 By 1952 the revised laws again allowed the ownership and making of certain hunting and sporting guns, and a new factory was built in Münnerstadt, close to the iron curtain that separated the two parts of Germany. Very early on they purchased one of the first available cold hammer forging machines for the making of shotgun and rifle barrels, and they began selling barrels to other gun manufacturers. 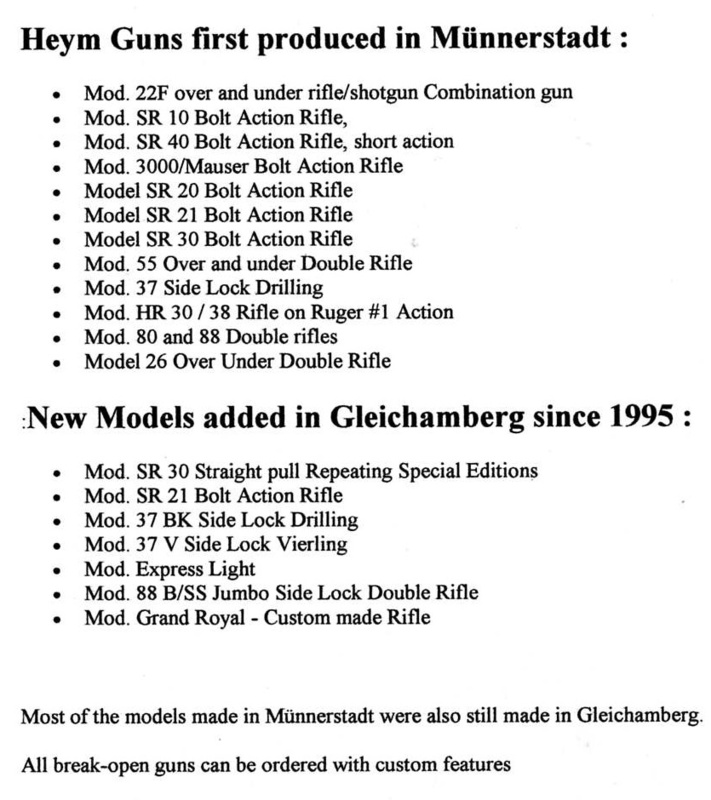 The list of gun models that were developed in Münnerstadt and those that were added after the move to Gleichamberg is shown on the right and can be enlarged. Only very few guns that are listed were discontinued or superseded by improved and upgraded models. 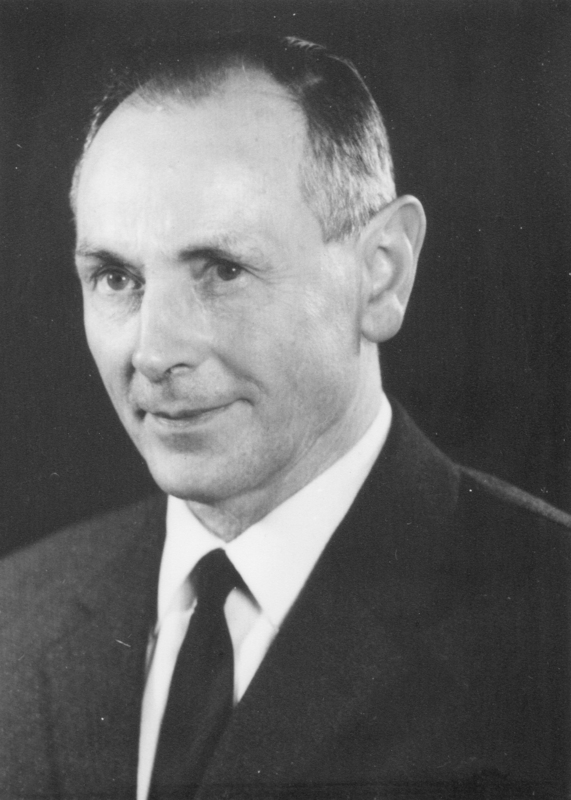 Rolf Heym took over the management of the Heym Company from 1963 up to his death in 1972. 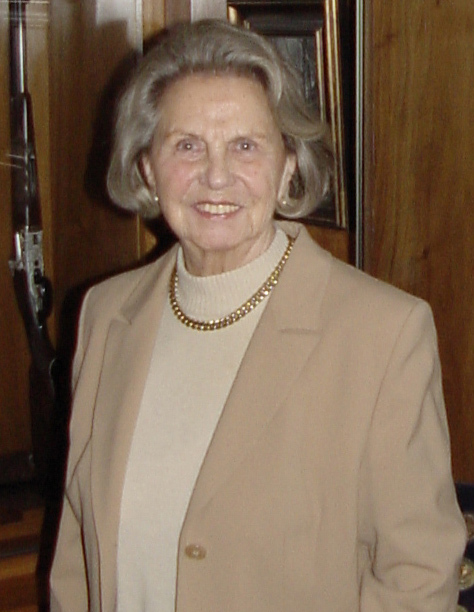 At this time Elisabeth Heym took over the management of the company together with her husband, Hubert Dschulnig. 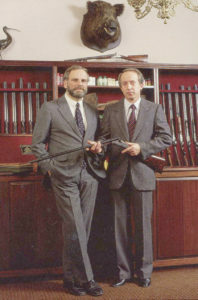 Peter Bang became the plant manager, and it was he who appointed Paul Jaeger, Inc. in Jenkintown, Pennsylvania as the importer of Heym guns in the USA. The Heym SR20Bolt Action Rifle was of interest to left hand shooters because the rifle was available with a true left hand action and the rifles were available with a classic straight comb stock that was at that time still preferred by many. At the urging of the Jaeger Company and of Tom Turpin, who had a close relationship with Heym when he was stationed in Germany, the Model 88-B Double Rifle and the Model 88-BSS Side-lock rifle became available early in the 1980s, one of the first affordable magnum caliber double rifles for most dangerous game hunters, lower priced than the Chapuis Double Rifles made in France and ahead of the Krieghoff Double Rifles made in Germany. Thanks to the kind permission from Safari Club International and from the German hunting magazine Wild und Hund, you can find information about both in Section 15 and the two articles in our Archive (Nr.65-T). In 1992 a new owner in Switzerland bought the company that was then taken over by a new owner in Munich who took advantage of the unification of Germany and the financial support by the German government to re-vitalize the East German economy. A new factory was built in Gleichamberg, and the Heym Company moved there in 1995. Gleichamberg is a small village that is barely inside the former Russian occupation zone that was the DDR (Deutsche Demokratische Republik) under a Communist Government. 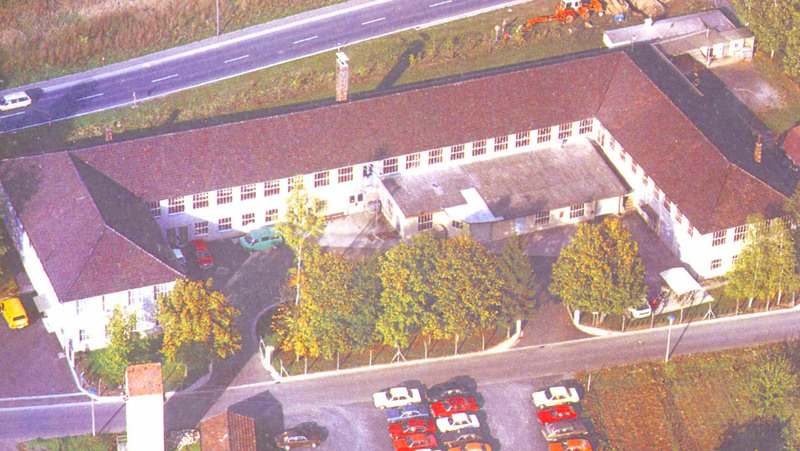 The factory is located about half way between Münnerstadt and Suhl, where Heym was originally located. The Heym employees could be taken by bus from Münnerstadt to the new location, and Suhl gun makers could also commute to the new factory. 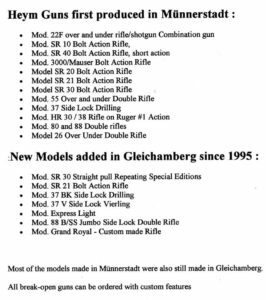 Most likely all new Heym guns are now proof tested in the proof house in Suhl. Photos of Heym guns custom options made in Gleichamberg, including an exquisite side lock double rifle, can be seen in our Archive (Nr.37-PG). On February 1, 1998 Thomas Wolkmann became the owner of the company who once again opened former markets in Russia and other former Communist countries. 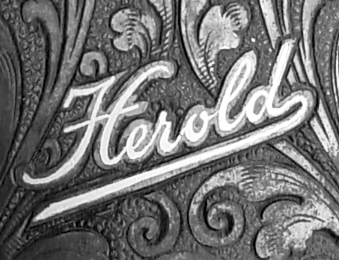 Under his leadership the company directed most their efforts to making fine custom built guns with many option, like action types, barrel configuration, fine wood and fine engravings. 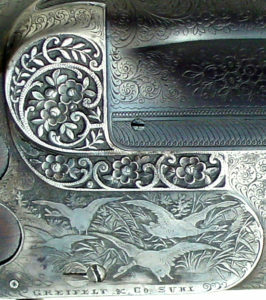 An interested buyer can visit the factory and discuss all details of a gun he wants to order and even meet the engraver who will do the engraving to his expectations. The company now seems to have found its niche in the world market and seems to be firmly anchored. Members of the German Gun Collectors Association visited the new factory in Gleichamberg and photos of the visit, giving you a good idea of the modern facilities and machines, are in our Archive (Nr.39-PG). Franz Jaeger served an apprenticeship in Zella-Mehlis and shortly thereafter went to America. 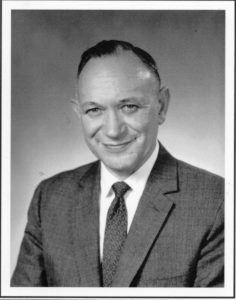 He worked for several companies in New York City, and then opened Bittiner & Jaeger with a partner,a business located on Broadway. He advertised the installation of selective single triggers into existing guns. He got married in New York and his first son Paul was born there. 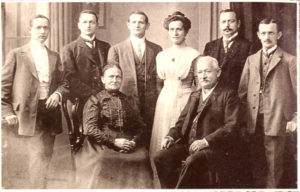 He then returned with his family to Germany and started his own business in Suhl. An Almanac about Franz Jaeger, his company, his inventions and his life is in preparation and will be offered when the time comes. You will find a good part of the story and more information in our Archive. 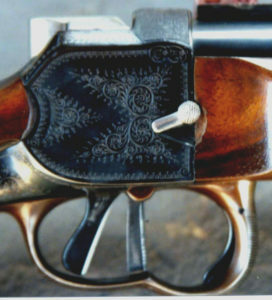 The Kurt Jaeger name is known to American gun collectors, but many think that he was a gun engraver. He was not, but he was from the old school when only the name of the gun business was found on a gun, never the name of the engraver. 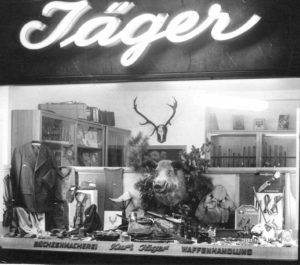 Kurt Jaeger had engravings done by Emil Willig, his son Claus Willig, both in Schweinfurt, The engraver Schildbach left Zella_Mehlis before the wall went up, worked first for the Wiesbaden Rod and Gun Club of the American Air Force and then at the Jaeger shop in Mainz. 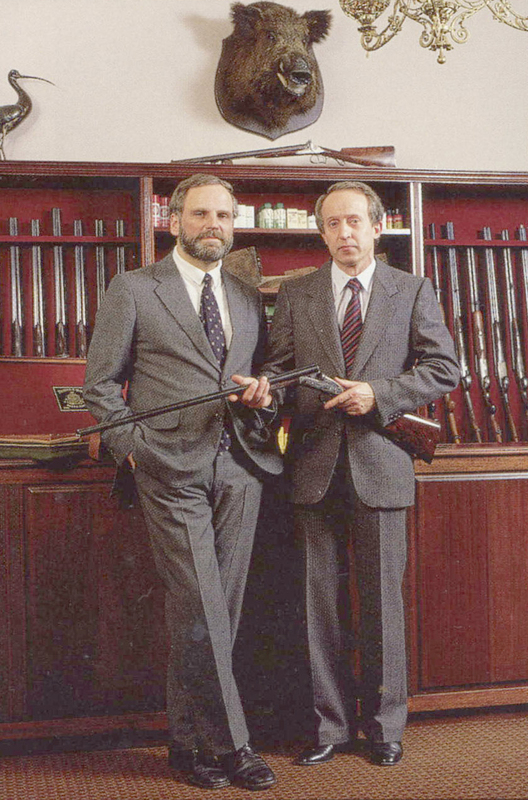 Kurt Jaeger and his family had left Suhl, the former German gun making center, before the wall went up, and opened his own gun business together with Dietrich Apel in Mainz. This was a time when Germans were still not allowed to have guns, and American Servicemen were the only customers in the beginning. 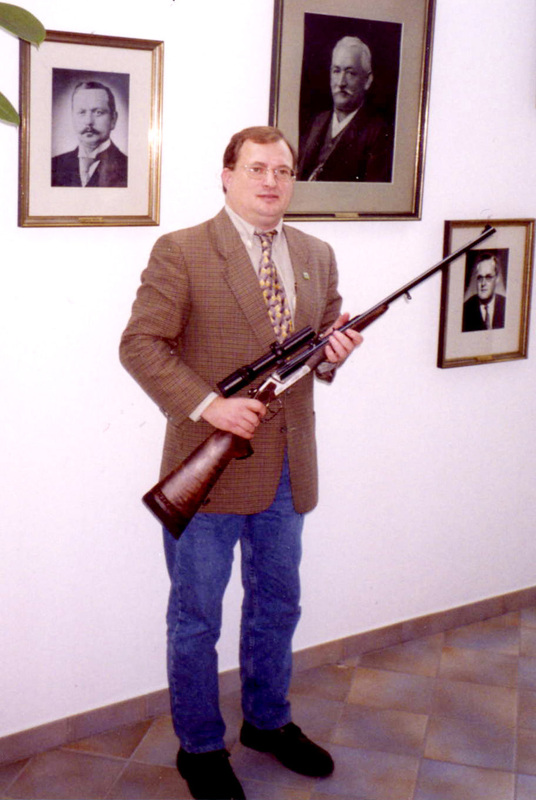 Kurt Jaeger also managed the shop of the Wiesbaden Rod & Gun Club for a while. The work consisted mostly of custom built bolt action rifles, scope mounting, repairs and many engravings done by the three engravers. An Almanac about Kurt Jaeger is in preparation, and will offer it in this website when the time comes. You will find a very interesting article about an AyA shotgun that Kurt Jaeger had engraved by Emil Willig in our Archive (Nr. 118-T). Paul Jaeger was born in New York City where his father worked as a gunsmith and founded his own company, Bittiner & Jaeger, on Broadway. With his parents Paul returned to Germany as a baby, and he grew up in Suhl in his fathers house and gun factory. After graduation he served an apprenticeship and went on to an engineering school. When a lost war brought hard times and the German economy had stagnated into a recession, he returned to New York City in 1927. Since he was an American citizen by birth he did not have to wait for a visa. He worked for several gun related companies in New York and moved to Philadelphia a few years later. He had established a gun shop in Jenkintown which borders on Philadelphia. He converted it to a machine shop during World War II and was part of the war production. When World War II ended he right away established a hunting and sporting goods retail store, expanded the gun shop and produced accessories for hunting rifles that became very popular, as well as the Jaeger Sporting rifles in four grades. For additional information, see our Archive.